What a tale these five squirrels can tell. Or should we say “tails”? The five juvenile gray squirrels are siblings whose tails somehow became entangled last week, thanks to the long-stemmed grasses and strips of plastic their mother used as nest material, according to KMSP TV. Luckily, a good samaritan discovered the knot of squirrels and took them to the Wildlife Rehabilitation Center at the Wisconsin Humane Society in Milwaukee. Because the animals need their tails for balance and warmth, they had to be untangled carefully. 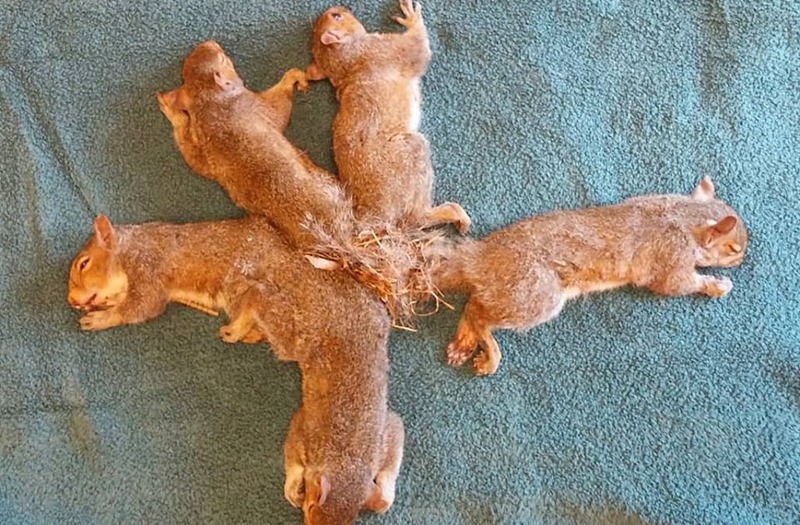 After rescue workers anesthetized all five squirrels, the center said they began “unraveling the ‘Gordian Knot’” of tails and nest material. There were some challenges: Rescuers couldn’t immediately tell whose tail was whose, and impaired blood flow was causing tissue damage to the tails. But after 20 minutes of snipping away, the squirrels were finally separated from each other. As you can see from the photo above, some squirrels emerged more “bushy-tailed” than others. The center is monitoring all of them for a few days for any lasting damage to their tails from the too-close encounter.